The City of Los Angeles rolled out new Venice Boardwalk Ordinance (LAMC 42.15) and initiated concentrated effort to remove homeless people from Venice. The City of Los Angeles, specifically LAPD’s Pacific Division and Councilman Bill Rosendahl’s office, decided that roll out for the new Venice Boardwalk Ordinance (LAMC 42.15) was a good time to initiate yet another concentrated effort to remove homeless people from Venice. Up went the new signs on the Venice Boardwalk, which should briefly state the rules for LAMC 42.15 restricting vending. But wait just a minute! 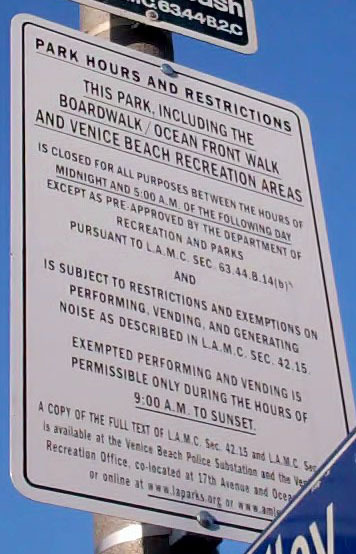 The top half of the sign, and the first thing you read, is about LAMC 63.44(B)14b: a Los Angeles City law that closes the beach between midnight and 5am, a law that considers the beach a city park, a contested law because it was created and enforced without the required California Coastal Development Permit. Evidently the city decided, behind closed doors, that this contested Beach Closed Law now applies to the Boardwalk. The Venice Boardwalk is actually a street named Ocean Front Walk (OFW) with housed people living on it, with multiple bars that stay open past midnight, and it is used by many different people for exercise and dog walking at all hours. If OFW is now part of the Beach/Park and the City is applying the Beach Closed Law to this street, then no dogs are allowed, no smoking is allowed, bars will need to be closed before midnight, and housed OFW residents should be liable for being ticketed between midnight and 5am the same as anyone else. Next came an obviously organized show of support for the upcoming homeless removal effort at a Venice Neighborhood Council (VNC) “Neighborhood Committee” meeting on Jan 23, chaired by the Blue Dog Dem supporter, VNC VP Marc Saltzberg. Taking a show of hands for those attending in favor of using LAMC 63.44(B)14b to remove homeless people from the Venice Boardwalk should be noted as an extremely low point in his political career. Maybe those voting, along with Saltztberg, are secretly (or not so secretly) hoping to ship homeless people to camps somewhere. The first main speaker at this VNC meeting was LAPD’s Lt Paola Kreefft, who is the officer now in charge of the Venice/Oakwood Task Force – formerly known as the Venice Homeless Task Force; responsible for threatening, ticketing, towing, arresting, and impounding the pets of an unknown number of people living in vehicles. Lt Kreefft did not express any real knowledge of a properly developed enforcement guideline for this newly interpreted version of the Beach Closed Law, LAMC 63.44(B)14b. Yet Lt Kreefft did appear quite clear when stating that enforcement will target those loitering, meaning homeless people. The next speaker at the Jan 23 VNC meeting was Arturo Pena from Councilman Bill Rosendahl’s office. His claim to defame was announcing that the Jones Settlement does not apply in Venice, based on interpretation of recent case law by the City Attorney (?). This is a lie he surely did not make up by himself. Reports are that Lt Kreefft was heard in multiple prior public meetings stating the same. Pena publicly mocked Federal Judiciary Decisions, based on the Constitution of the United States of America, by saying that the problems Venice is experiencing on the Boardwalk (hoarding spaces and the swap meet junk being sold) is the fault of lawsuits filed against the City. The real problem on the Venice Boardwalk for the last ten or so years is that the Los Angeles City Attorney’s office could not write a constitutional law restricting vending and the LAPD cannot keep from violating civil rights. They cause the lawsuits. OK, so we expected police enforcement to come down on street people living in Venice and it started late Wednesday evening, February 15. Even though there was an attempt to warn people sleeping on Ocean Front Walk, there is always some who do not get the message or people who are too disabled to comply. One witness said that s/he was woke by a group of nine; LAPD officers, the LAPD Religious Outreach (which I will talk later about), and St Joseph Social Service Outreach. The LAPD officers insisted that they had only two choices: go to jail or go with the Clergy in a LAPD van to a shelter on 38th and Broadway (South Central). Because this person did not want to go to jail, s/he went to the shelter. According to this witness, the shelter was very overcrowded and it was an obvious fire hazard. People were coughing a lot and the cots were inches apart. This person had enough change to return by bus the next day and s/he helped a mentally ill person (also taken from Venice in the Religious LAPD van) to get back. Interestingly, St Joseph Center, who has nothing in the way of services to offer a homeless person in the middle of the night, was reportedly there taking personal information from this person in front of the LAPD. If St Joseph was doing a quasi street intake, then we would expect them to give a bus token to return for services! Otherwise, why are they even there? Just to give out McDonald vouchers?! Meanwhile on 3rdAve, the only industrial street in Venice with no homes, it was reported that LAPD officers told people that the Jones Settlement does not apply in Venice, only in Skid Row, and that they would be arrested if caught sleeping on the side walk in Venice. People reported being told to go to Skid Row. Venice is part of the City of Los Angeles and the Jones Settlement ( http://www.wetnostril.net/JonesSettlement.html ) does not specify locations where it applies or where it does not apply in the city. It basically instructs the LAPD not to enforce LAMC 41.18d (the City’s sitting, sleeping, lying on the sidewalk law) between 9pm and 6pm. So, in fact, Jones does apply to Venice. The only thing written in Jones about Skid Row is the condition that requires the City to build supportive housing, 50% of which in Skid Row. On Thursday, Feb 16, a group of Venice locals that have been opposing the criminalization of homeless people for some time along with Occupy Venice gathered on 3rd to oppose the police enforcement. It was a show of community support for street people who were obviously doing nothing more than surviving. Lt Kreefft did come by to repeat the lie that Jones did not apply in Venice. Multiple black and white LAPD cars drove back and forth on 3rd with “get out of the street” on the loud speakers and one Sgt stayed for a good portion of the evening, but no arrests or tickets were issued. Hooray. 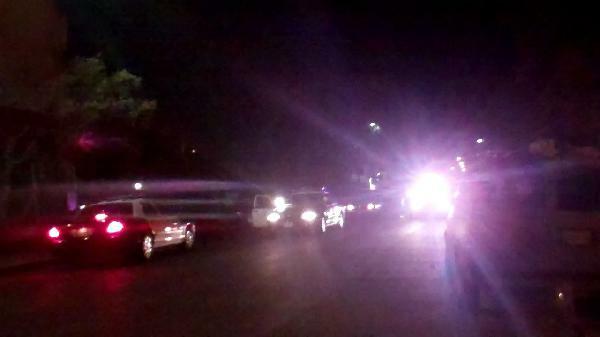 However, sometime after 11pm that night, the LAPD Religious Outreach did show up in their LAPD Pacific Division van. The two Clergy handed out toiletry bags, with LAPD back up (plus the officer driving the van for them), and they tried to get people to get in the LAPD van to go to the 38th and Broadway shelter. People approached these “Clergy” and asked if they could get a ride back in the morning or if the shelter would allow them to bring a pet. If someone with no money did get in the van it was relocation to South Central for them and they would have to abandon their pet in Venice. Another issue should be why the LAPD has a religious outreach consisting only of Fundamentalist Christian clergy. Due to the lack of non-Christians or Christians that believe in liberation theology (like the Catholic Worker) in this LAPD Religious Outreach, it is a violation of the Separation of Church and State guaranteed by our First Amendment. It is simply not funny that the public servants who take an oath to uphold the Constitution of the United States of America, like the LAPD or a City Councilman, are the very people violating these laws or mocking them.